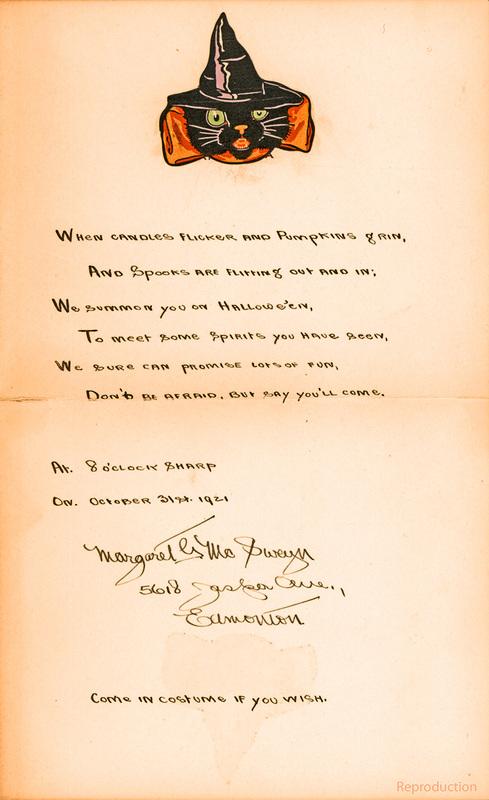 Halloween parties for children and adults were popular in the early 1900s. Costumes, food, and dance all played an important role. 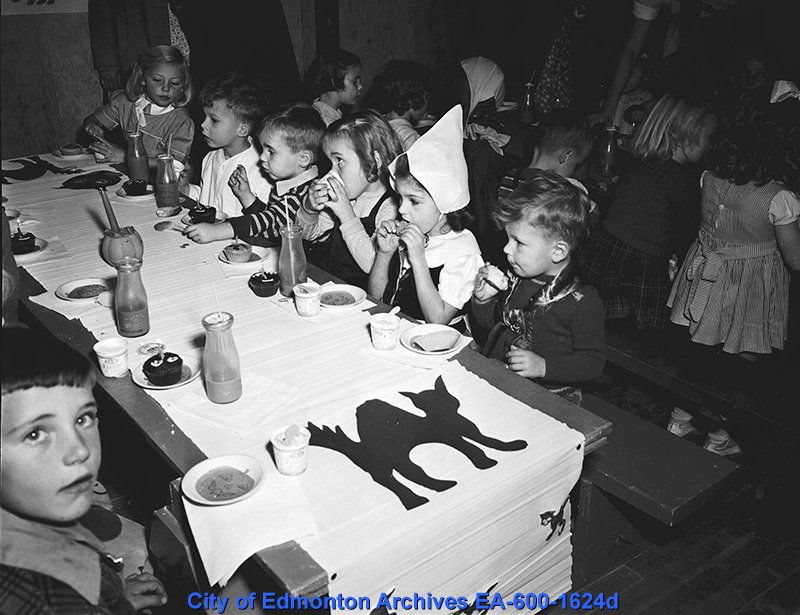 Halloween parties could be big or small, and were hosted by individuals, community organizations, and even churches. Given the Victorian values of the time, Halloween parties were also an opportunity for young people to socialize in a “respectable” way under adult supervision. 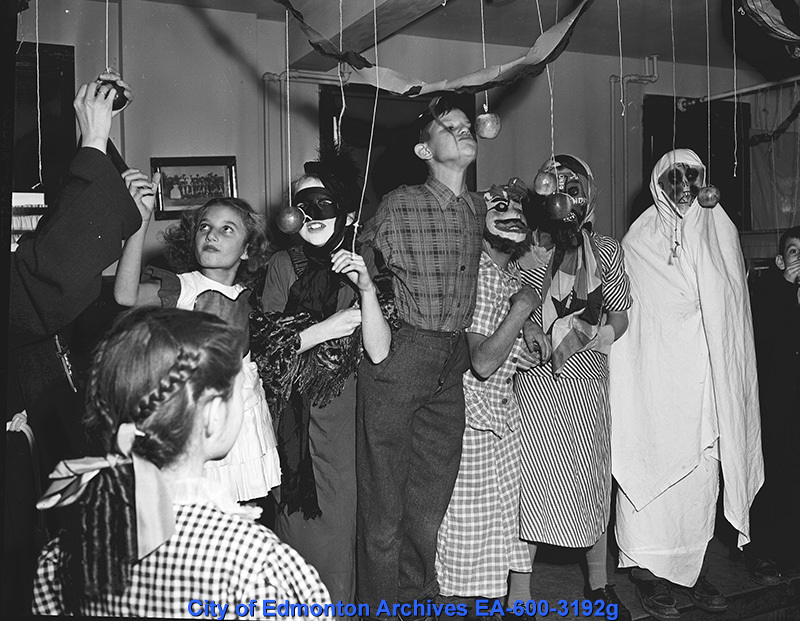 Edmonton’s first recorded Halloween party occurred in 1902. 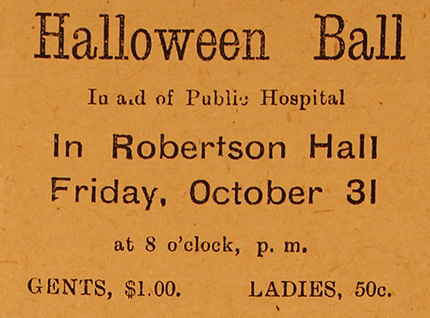 A fundraiser for the Public Hospital, the ball was held in Robertson Hall, and included costumes, dancing, and tea, coffee, cakes, and sandwiches. 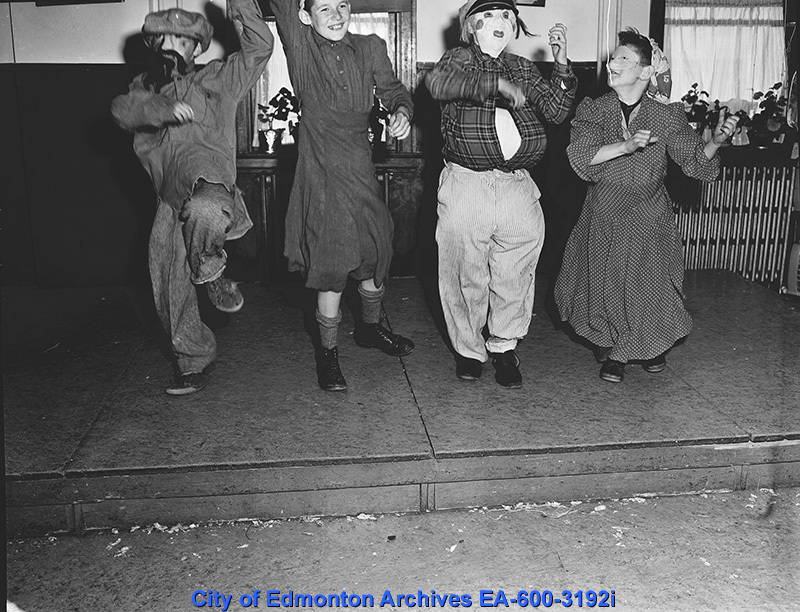 In the 1920s organized Halloween parties became more popular as community groups like the Optimists and YMCA began hosting events for young people. This was done in an attempt to keep them out of trouble and made Halloween parties accessible to everyone. 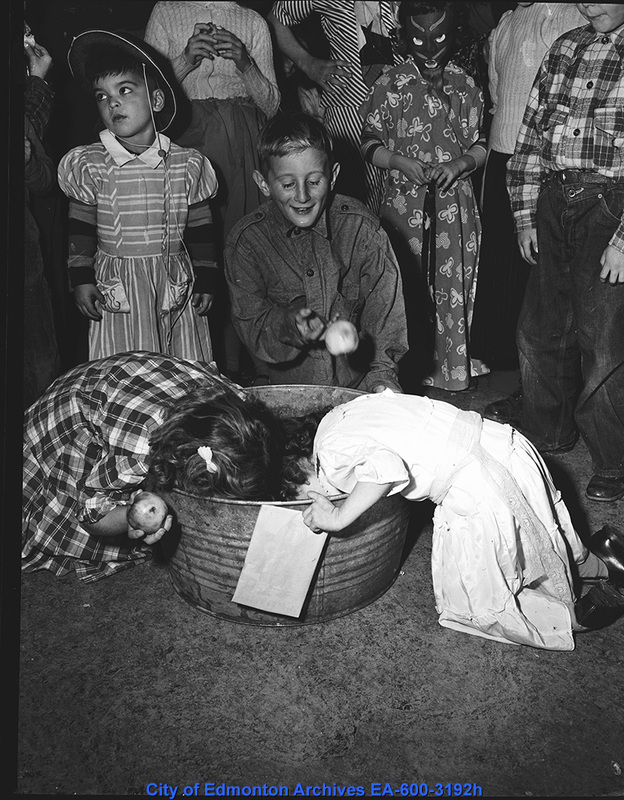 Bobbing for apples is closely associated with Halloween. 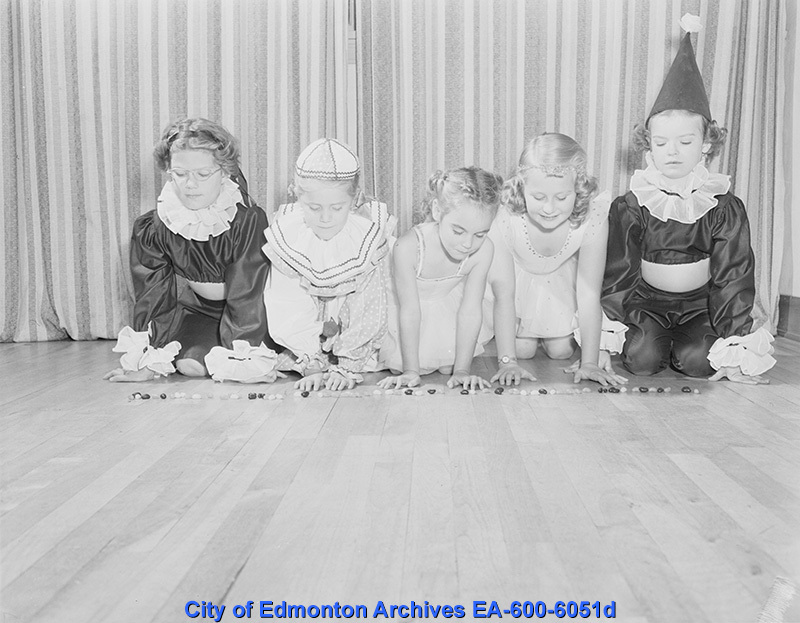 It is one of many traditional games with roots in 19th century divination rituals. Many of these rituals came overseas with Scottish and Irish immigrants and became staples at Halloween parties. 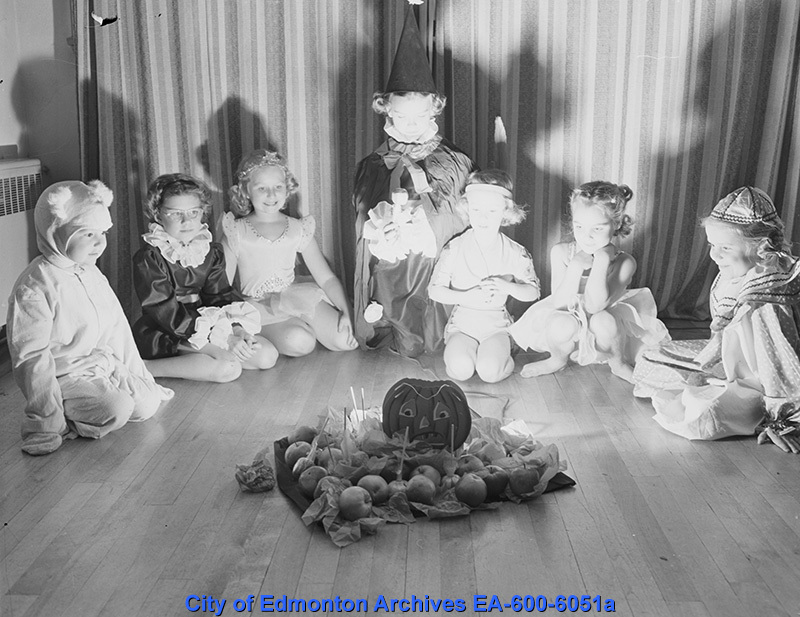 Other popular Halloween games included “snap apple”, roasting nuts by the fire, and rituals involving a flickering candle and a mirror. These games were used to learn about future love, marriage, fame, and fortune. 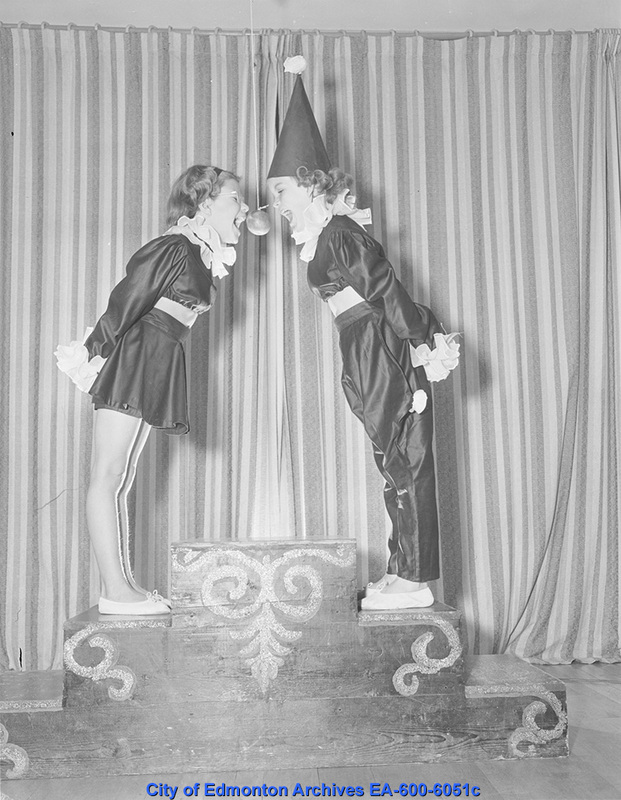 In the early 1900s nuts, candies, toffee, and popcorn were all popular goodies to give young revelers or serve to party guests. The recipes below do not mention Halloween specifically but their use of popcorn, nuts, and sugar make them great examples of Halloween treats. Popcorn Balls – 1 ¼ cups white sugar, 1 ¼ cups brown sugar, ½ cup corn syrup, ½ cup water, ½ teaspoon salt, 2 tablespoons butter, 2 tablespoons Blue Ribbon vanilla, 3 quarts popped corn. Mix sugar, syrup and water, and stir until dissolved. Then let boil until brittle stage is reached, 290 degrees F. Remove from fire, add butter and salt and pour over the corn, mixing with a spoon. Grease fingers and shape into balls. Candied Pop-Corn – Put into an iron kettle one tablespoonful of butter, three tablespoonfuls water, one tablespoonful white pulverized sugar. Boil until ready to candy, then throw in three quarts of nicely popped corn. Stir briskly till candy is evenly distributed over corn. Take kettle from fire, stir until cooled a little and you have each grain separate and crystallized with sugar, taking care that corn does not burn. Nuts of any kind prepared in same way.